It’s even in the Bible where Isaac offers Abraham a mix of milk and snow. I don’t know about you, but it’s my very favorite Italian dessert. There are many famous contenders – tiramisu’ (originally from Treviso), “panettone” (from Milano), “pandoro” (from Verona), the chocolate Easter egg (Torino), and less known “zuppa inglese” (nothing English about it, it was born between Emilia and Toscana). Sicilian cassata and cannoli are well traveled, too. Take your pick. But in my book, gelato beats them all hands ready to hold that crunchy “cialda” cone and melt as one with the flavors, even in winter. Artisanal gelato historian Luciana Polliotti says Alexander the Great could not have enough snow mixed with honey and fruit. Ancient Rome loved “nivatae potiones”, or snow potions invented by the famous general Quinto Fabio Massimo. He was nicknamed “il Temporeggiatore” (cunctator) because he wore out Hannibal during the second Punic war. When the Arabs ruled Sicily, people started sipping a beverage made from fruit and cane sugar. They preserved it in containers surrounded by snow or ice. The gift was an evolution of the Sicilian sherbet made from the snow on the Etna, then perfected in Firenze. Since the middle ages, one could find “nivaoli” or people who collected the snow in winter on the higher peaks of Sicily, in addition to the Vulcan. They collected the snow in containers built in natural and artificial caves. From there, the snow was kept until summer when it was transported to the sunny cities to become sherbets. You can’t keep a secret so delicious, even when it melts away. Fame for the Sicilian desserts soon spread to the Renaissance courts. Especially Firenze. To make sherbet, they would swirl the liquid in primitive sherbet makers placed inside wooden tubs filled with broken ice and salt. Then they placed the resulting mixture in metal stamps kept under ice. If you’re thinking icicles, you’re correct. The stamps were shaped as pyramids, fruits, lambs, doves, and many other forms. Gelato as we know it today was invented in the seventeenth century, also in Sicily. Fisherman Francesco Procopio de’ Coltelli inherited a strange machine his grandfather invented to produce sherbets. Lo and behold, the machine could produce a magnificent product. Procopio took it to Paris and in 1660 he opened what became the most notable coffee shops in the city – Cafè Procope. It was probably in Paris that he started adding milk to Sicilian flavors – pistachio, almonds, lemons, oranges, chocolate and coffee. Voila’, “il gelato” was born. Luis XIV, Voltaire, Robespierre and Danton, even the young Napoleon got in line (well, maybe not literally), crazy for gelato. But you had to have a permit, and an exclusive right to flavors invented would not hurt. Procopio went to Versailles to pick up the exclusive concession to produce water ice (granita), fruit gelato, anisette and cinnamon sweets, “frangipane,” lemon juice and orange gelato, cream, and strawberry sherbets from King Luigi XIV. Success is very attractive and competition was not far behind. In 1798, during the years of Napoleon’s rise, Café Napolitain by Alessandro Tortoni from Napoli added its own concessions to this list. By the way, milk as an ingredient was well known already in the previous century in Florence, Buontalenti had spilled the secret. Since then, gelato’s success kept growing. 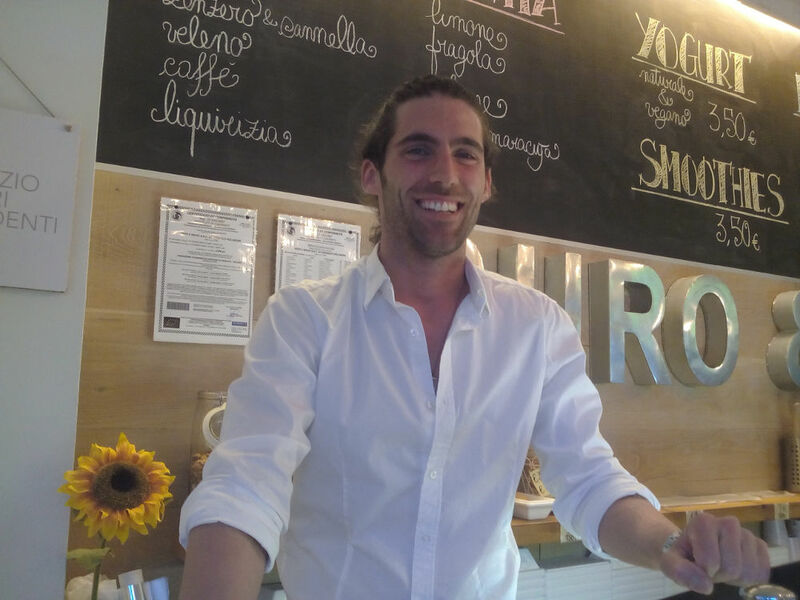 The first gelato-place in New York city opened thanks to Giovanni Bosio from Genova. The idea of putting ice cream between two slices of wafer was born in Milano in 1906 thanks to Giovanni Torre di Bussana. Otello Cattabriga from Bologna built the first automatic maker in 1927. It made it easier to make gelato. But it also heralded the beginning of industrial production, which also drove artisanal makers to extinction. Thank heavens the story doesn’t end on a sour note. In the last thirty years, gelato has had its renaissance. In Italy you can now find dark chocolate gelato both with and without milk – get a taste and you have scientific evidence it’s a gift from heaven. Little-known fact – I worked in one of the first and most popular “gelateria” (those fancy gelato shops) through high school. Fifty different flavors! With practice I was able to mold rose petals and waves on the cone with the flat scoops.